The Pistol Marksmanship ribbon was established on October 14, 1969, by the Secretary of the Navy John H. Chafee when he redesignated the ribbon to the Expert Pistol Shot Medal to permit marksman and sharpshooters to wear the ribbon for qualifying below the expert level. 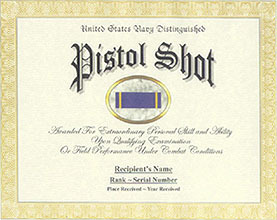 The Pistol Marksmanship ribbon has been in effect since October 14, 1969. The Pistol Marksmanship ribbon is worn for scoring at the marksman, sharpshooter or expert level of qualification on a prescribed course of fire for the rifle. The Pistol Marksmanship ribbon is worn after all other ribbons. Qualification at the marksman level entitles the individual to wear the ribbon without device. Qualification at the sharpshooter level is indicated by a bronze letter "S"
Qualification at the Expert level is indicated by a silver "E" on the ribbon.